Last night I managed to get a sneak peek of the new film ‘Snow White & The Huntsman.’ While the film is visually spectacular and much darker than other ‘Snow White’ films, I found much of the plot confusing, unnecessary and even disturbing. Luckily, I was keeping a journal as I was watching the film. -The film opens up with the dwarves singing ‘Heigh ho, heigh ho, it’s off to work we go.’ This seems to be a nice homage to Disney. -It’s 20 minutes later and the song is still going on. 20 minutes is far too long for any song in a movie, let alone one that repeats the same 10 words over and over. The audience around me is growing extremely impatient. -25 minutes in and the song has finally ended. -25 minutes and fifteen seconds, Snow White just peeked her head into the mine and asked the dwarves what they were singing. Several people in the audience shouted “NO!!! !” The dwarves have restarted the song. -50 minutes into the film, the song is finally over. One of the dwarves shouted “one more time!” About a third of the audience has walked out. -An hour and fifteen minutes later the song is finally over. -While the original tale featured 7 dwarves, this film features 700 dwarves. It is extremely annoying that the filmmakers chose to force the audience to watch while the dwarves spend the next 15 minutes introducing themselves. -Really? The Huntsman refers to former Republican presidential candidate and Utah governor Jon Huntsman? -While it’s a cool effect to have the Evil Queen see a creepy guy when she looks into the magical mirror, it’s weird that at this point in the film, she’s questioning if she’s a dude or not because of it. -It is hard to believe that Snow White would fall in love with a dwarf, let alone Sneezy. -Snow White keeps begging Sneezy to ‘change her’ into a dwarf. This seems to be a direct rip-off of Twilight, not to mention the fact that this request makes no sense. – The queen orders one of her henchmen to fetch a poison apple to give to Snow White. When the henchman tells her they’re all out of poison apples, the queen instructs him to “just go to Wal-Mart and get an apple then, their produce is awful.” I don’t think Wal-Mart is going to appreciate this scene. -It was cool when the queen disappeared into a flock of birds. Having her disappear into a gang of hippos here, however, just looks clumsy. -Snow White is supposed to be in a death-like sleep after eating the poison apple, so why does she keep getting up to go to the bathroom? -While chasing the Evil Queen up a cliff, Grumpy says ‘I wonder what’s happening at the diamond mine.’ The film then cuts to the diamond mine. Nothing is happening. No one is there. Cut back to the cliff. The queen is inexplicably dead. Happy says ‘welp, that takes care of that.’ This seems like a very unsatisfying end for a film’s arch-villain. -Prince Charming leans into kiss Snow White. The film freezes and the words ‘To be continued?’ appear on the screen. First of all, there should never be a question mark on the words to be continued. Second, how could this possibly be continued? Even more annoying, there’s a promo for Part II in which we see the Prince kiss Snow White and wake her up. The words ‘The End’ appear for a split second before the director can cut away, implying the next film will only be about 30 seconds. 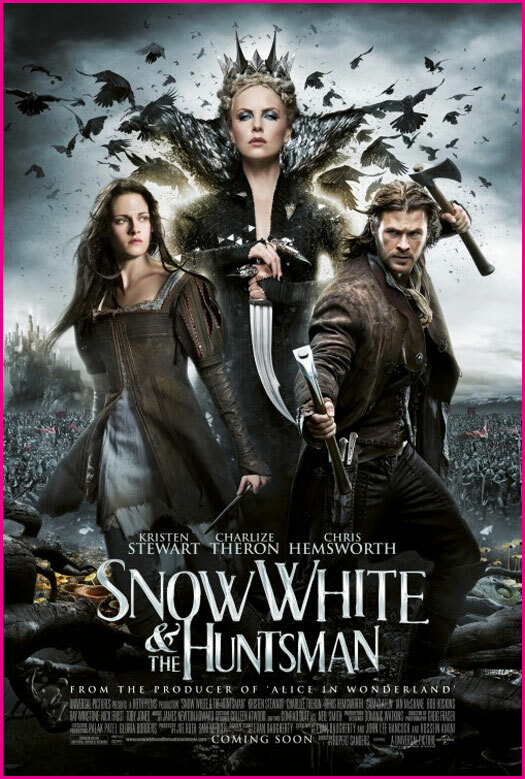 Overall, I would give ‘Snow White And The Huntsman 5 out of 5 billion stars. I apologize for any trouble this may have caused. Is laughter banned in your household? Hahaha I like that last part. yes of course, as it is in all english households. be seen and not heard, and all that you know? tragic existence. I feel your pain. In my household it was be heard and not seen. It was extremely difficult. well the film was about 16 hours long. I had to take some bathroom breaks so I may have missed some good parts. wow, you saved me 30 bucks!